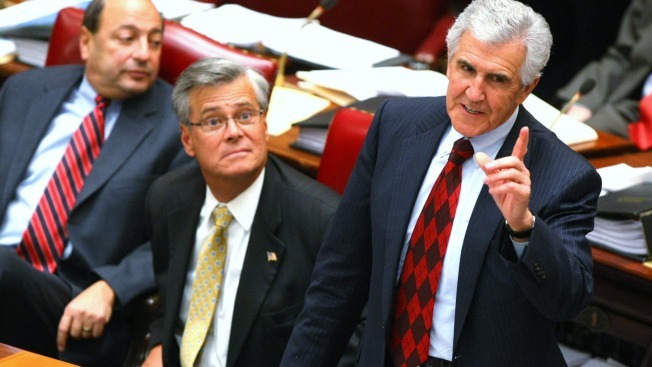 The former leader of the New York Senate and his son pleaded not guilty to public corruption charges on Monday after prosecutors told a judge that investigators secretly intercepted thousands of their telephone calls. Asked by U.S. District Judge Kimba Wood to outline the government's evidence, prosecutor Rahul Mukhi said investigators had amassed 2,400 recordings of calls by the 67-year-old Dean Skelos and his 32-year-old son, Adam. The audio came from wiretaps lasting about 2½ months on the father's phone and four months on that of his son, the prosecutor said. The evidence also includes hundreds of thousands of documents, including emails, bank statements and phone records, Mukhi said at the arraignment in federal court in Manhattan. The Long Island Republican and his son pleaded not guilty through their lawyers to an indictment unsealed last week that included two conspiracy counts, two extortion counts and two counts of soliciting bribes. Neither spoke in court and both declined to comment as they left the courthouse, as did their lawyers. The two were released on bail earlier this month after they surrendered to face charges that Dean Skelos teamed with real estate developers, an environmental technology company and campaign donors to collect hundreds of thousands of dollars in bribes, gratuities and extortion payments to benefit his son. The indictment added to the accusations by claiming a medical malpractice insurer gave Adam Skelos a no-show job while it lobbied his father on legislative matters. The government is seeking forfeiture of $300,000 from bank accounts in the name of Adam Skelos and his wife, along with property in Rockville Centre, Long Island. Dean Skelos was New York state's most powerful Republican before stepping down from his leadership post a week after his arrest. He has said he will fight the charges and that he and his son will be vindicated. His arrest came four months after federal prosecutors in Manhattan arrested Assembly Speaker Sheldon Silver, a Manhattan Democrat, on charges that he took nearly $4 million in payoffs. Silver also relinquished his position after his arrest, though he retained his Assembly seat. He has pleaded not guilty. Skelos and his son are due back in court on July 30.